The I/O Setup window now includes options to select a default output for any new tracks you create, and to choose the monitoring path that will be affected by the new TDM-only AFL and PFL solo options. Version 6.9 of Pro Tools is here, bringing with it the usual slew of improvements and changes — and the odd pitfall for the unwary. Here's what you need to know if you're thinking of taking the plunge. No sooner have Digidesign released Pro Tools 6.7 than out comes version 6.9! Thankfully, this gets all the versions in sync again, with the exception of the new M-Powered edition. Quite a few of the improvements are for audiovisual work, and include options that were only available in v6.6, improving on them and bringing them into one unified version. For instance, Pro Tools 6.9 now works with the Avid Mojo and Digidesign AV Option V10 video I/O peripherals on Windows platforms. In this month's Pro Tools Notes, we're going to take a look at some of the most important new features in version 6.9. Perhaps the most basic improvement is that the number of busses has been increased to 128, and the maximum number of Aux tracks to 160, though in both cases, this applies to TDM systems only. One of the biggest changes in version 6.9 concerns how to select multiple items in a list. Before v6.9, to select more than one item in the Region List you had to click on the first item you wanted and then Shift-click each additional item. Now, you still click on the first item, but if you then Shift-click on the last item in a list you want to select, all the items between are selected — just as the main Edit window has always behaved when you wanted to select a contiguous range of regions. If you want to deselect any item or add any non-contiguous items to the selection within a list, Command-click (Mac) or Ctrl-click (Windows) on them. This works in the Region List, Show/Hide list, when selecting tracks in the Edit and Mix windows, and in the I/O Setup window. In addition, for these lists there is now a Marquee option: if you move the cursor to the left of the list of names you get a 'target' cursor which can be used to lasso a group of items. If you need to add to a group of selections, hold down the Command (Mac) or Ctrl (Windows) key: the cursor changes to a marquee with a small '+' symbol, allowing you to drag round and add the extra regions you want to select. Again, simply clicking with the Command (Mac) or Ctrl (Windows) key held down also permits you to add or remove individual items. There are now keyboard shortcuts to enable you to change the track view (for instance between Waveform and Volume or Pan graphs) and it is possible to do this on a number of selected tracks simultaneously. Select the appropriate tracks, then hold down Ctrl+Command (Mac) or Ctrl+Start (Windows) and use the left and right arrow keys to toggle through the track view options. You can also use an extension of this shortcut to change all tracks at once, by adding in the Option (Mac) or Alt (Windows) key as well. There are also some new solo features. In the Operations tab of the Preferences window you will see some new Solo Latch options. Latch is the way Solo has always worked before v6.9, where any subsequent Solo buttons you click will latch as well. With the new X-OR (Cancels Previous Solos) option selected, however, pressing another Solo button will deselect the previous one. You can deselect this option by pressing and holding a Solo button on the first soloed track, whereupon subsequent Solo buttons will latch. On TDM systems you can also now have the Solo button work as a PFL (Pre Fade Listen), as an AFL (After Fade Listen), or Solo In Place (which is how Pro Tools worked before v6.9). You can select which option you want in the Operations menu. You will also find a new option in the I/O Setup window that allows you to set which hardware outputs the PFL or AFL signal path will use. 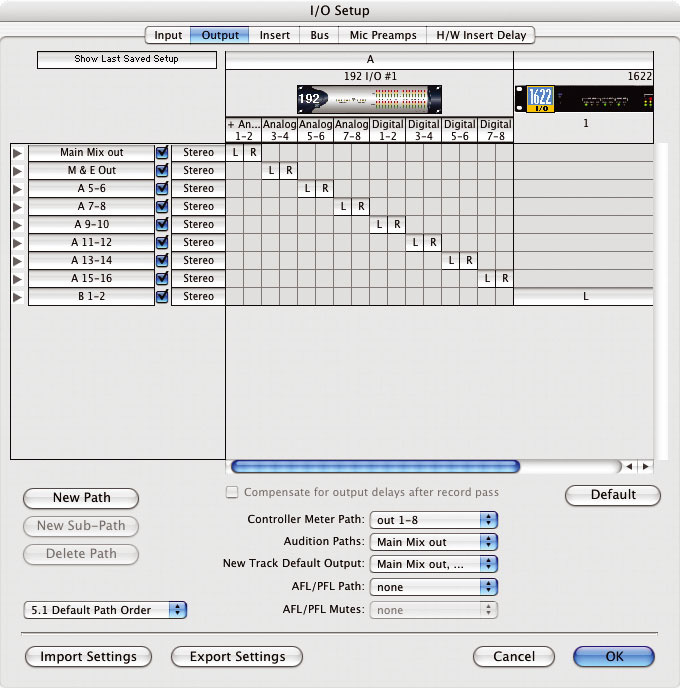 This feature is really intended for users with Digidesign's Icon D-Control and D-Command control surfaces, which are designed to automatically route the PFL or AFL signal path to your monitors. 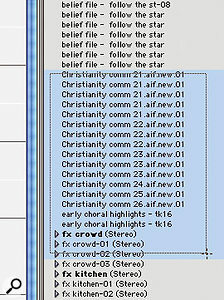 You can use this feature without either of these control surfaces by routing the PFL/AFL signal to another pair of outputs and arranging for these to be added to your monitor path externally to Pro Tools, then going to the I/O Setup window to choose which output path (your normal monitor path) will be muted when you press a PFL or AFL button. Note that this feature requires you to be using the Surround Mixer plug-in, and will not work if you are using the Stereo Mixer plug-in. (You will have selected this when you installed Pro Tools.) Be aware that the PFL/AFL option also uses significant DSP resources as it adds several more busses and signal paths to Pro Tools. There have also been a number of small changes to the I/O Setup window, including the added feature of a New Track Default Output pop-up menu, which will allow you to select busses as well as output paths. Clicks at the end of regions when recording with automatic delay compensation on are still a problem. When you double-click a Pro Tools stationery pad (template) ready to create a new Session based on it, you end up copying the template and creating audio files, fade files and Session backup folders where the template is residing. This is not a Pro Tools bug but an OS X 'feature', and workarounds include opening the template from within Pro Tools 's Open Session dialogue or the workspace, or dragging the template's icon onto the Pro Tools icon in the Dock. Why is this a problem in 6.9 when it didn't seem to happen in 6.7, I hear you ask? Well, actually it did happen with 6.7 for some users, and Digidesign are not sure how or why, but it is definitely an issue for all 6.9 users. In 6.9, the shortcut for the Replace Region command, which allows you replace multiple instances of an audio region in a playlist with another region, is now Command and Shift+drag (Mac) and Ctrl and Shift+drag (Windows) — previously, the Shift key wasn't required. Digidesign have promised to get this updated in the next revision of the manual. 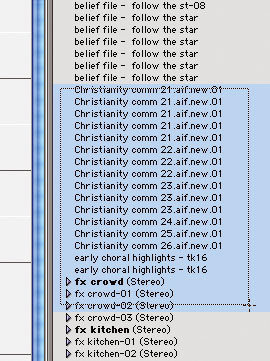 When you create a new Playlist, Pro Tools increments the suffixes by one. This is fine until you add a new track to a group — then suddenly the suffixes are no longer in sync. The new feature inserts blank Playlists in the added track, so that the suffixes are always in sync. A new feature in 6.9 called 'Constrain to next or previous' allows you to constrain an automation breakpoint to the next value or the previous value when you are using the grabber tool (not the smart tool). Hold down Command (Mac) or Ctrl (Windows) before you click to 'constrain to next', and hold down Command and Option (Mac) or Ctrl and Alt (Windows) before you click to get 'constrain to previous'. The 'fine adjust' feature is still there as normal: to get it, you simply hold down Command/Ctrl after you click just as before. Developed in collaboration with Sound Fuel, Digidesign's new Solid is a TDM synth plug-in for HD and HD Accel systems running Pro Tools 6.7. It's currently Mac-only, with Windows XP support due later in 2005. Solid 's two oscillators can reproduce analogue waveforms for subtractive synthesis or provide FM operators, allowing you to integrate classic analogue sounds with FM. There's also a wide range of effects at the end of the signal chain, from distortion to flanging. With HD Accel cards, Solid operates as an eight-part multitimbral synth that can produce 32 voices per DSP chip, while HD cards enable Solid to produce four-part multitimbral sound with 16 voices per DSP. In the old days, when you went to select a plug-in you got a long list starting with the Digirack plug-ins and then all the third-party ones in alphabetical order. Then we got grouping by categories, which helped no end, and now we have the option to choose how to categorise the plug-ins using a drop-down menu in the Display tab of the Pro Tools Preferences window. You can choose between four options. Flat List lists the plug-ins in alphabetical order. Category is the system used in v6.7, where the list is organised by function into categories such as EQ and Dynamics. 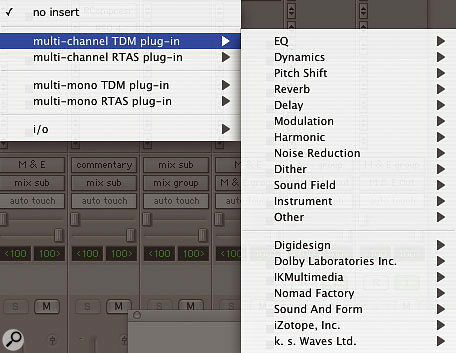 Manufacturer arranges your plug-in list according to who made the plug-in, so all your Waves or Digidesign plug-ins will appear in a group. Category & Manufacturer combines the two options above into one menu list, with the categories first and the manufacturers underneath. There are a whole raft more new features in Pro Tools 6.9 that I haven't mentioned here, most of which are specific to the TDM version. Digidesign have added support for the new Icon D-Command control surface and new capabilities for Icon D-Control systems such as inline console emulation, new automation features and more. The new EQ III plug-in is bundled as standard, while Pro Tools 6.9 improves integration with third-party sound library managers on Windows XP and incorporates a 'Send to DigiDelivery' command to facilitate collaboration through Digidesign's file delivery system. Pro Tools v6.9 is available as a free update for Pro Tools HD system owners who have Pro Tools 6.4 software or later, and for Pro Tools LE system owners with Pro Tools 6.7. It is available for download from Digidesign's web site or on a CD from dealers or the Digi Store for a small charge. Take a day to go through the 84-page PDF document and see whether the new features will benefit you. Pro Tools M-Powered, reviewed in last month's magazine, is now compatible with more M-Audio interfaces, supporting the Firewire Solo, Firewire Audiophile, Delta 1010, Delta 1010LT, Delta 44 and Delta 66 in addition to previously supported Firewire 1814, Firewire 410, Ozonic, Audiophile 2496 and Audiophile 192. This extension of support now means that M-Audio's complete range of Firewire audio interfaces and Delta PCI cards is now compatible with PTMP. One thing for Mac users to be wary of is that not even version 6.9 of Pro Tools will work with Mac OS 10.4 'Tiger'. Digidesign make it very clear, but some folk have tried it nevertheless, and it definitely doesn't work. Digidesign have, however, announced that the OS 10.4 Tiger-compatible version of Pro Tools TDM will be available four to six weeks after Tiger's release, which should mean it's available in June . Compatible Pro Tools LE and M-Powered versions will be available eight to 10 weeks after the release of Tiger, hopefully in early July.